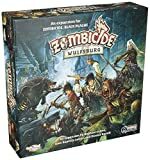 The following pages contain a Tutorial Mission to help get you acquainted with the game and ten Missions to thoroughly put your Zombicide survival to the test! You can play these Missions in sequence, or you can tackle whichever one suits you best at the time, given that they vary greatly in style, size, difficulty, and play time. 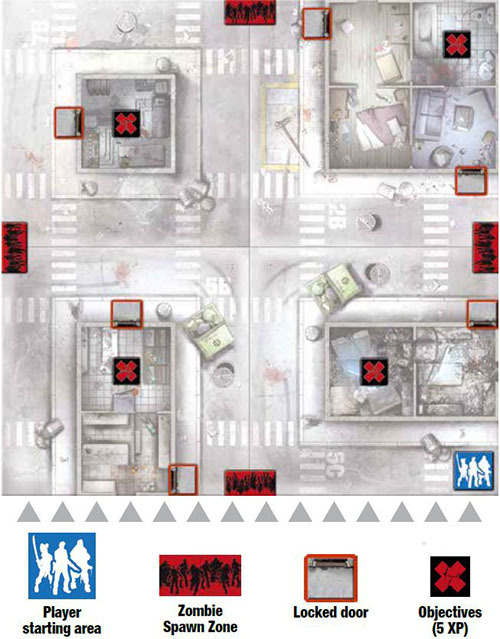 Special rules detailed in Missions supersede common rules and cards rules. We were with some friends when the first siren began to wail, quickly followed by countless others. In less than an hour, everything changed. The television and the radio announced horrible news. Tiles needed: 2B & 1B. Reduced Zombie deck. Use only the Zombie cards numbered 1, 2, 3, 4, and 41 to make the Zombie deck. Put the other ones in the box. Special starting equipment. Do not give the Pistol, Fire Axe, and Crowbar cards as starting equipment. Instead, put them at the top of the Equipment deck. They will be the first three cards drawn when Survivors search a Zone. Pan cards are dealt as usual. Our shelter is safe, for now. Unfortunately, our food supplies Won t last long. We ve decided to arm ourselves and go explore the surrounding houses. We cannot come back empty-handed. Tiles needed: 2C, 1C, 4B, 5C, 7B, 5D, 6B, 5E & 1B. Take all the Objective tokens. Find at least one Canned Food card, at least one Rice card, and at least one Water card. 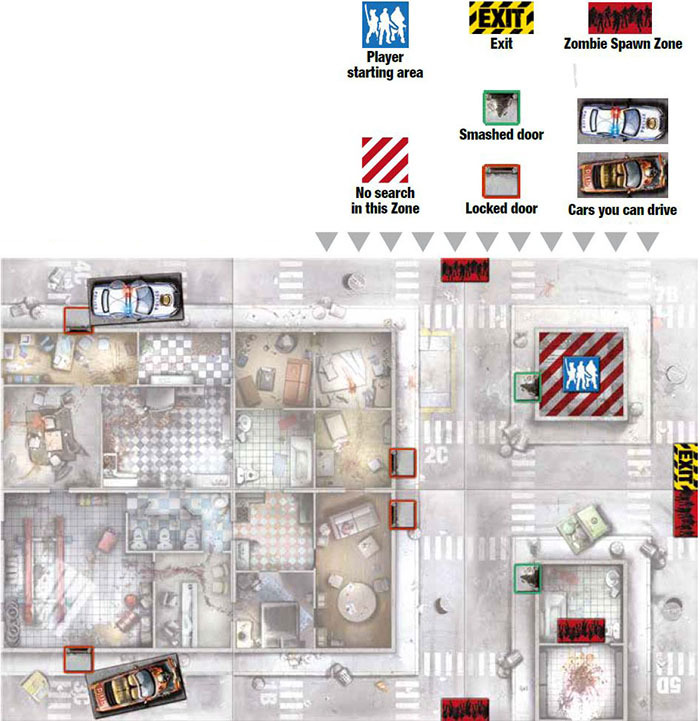 Once you have achieved the previous objectives, reach the Exit Zone shown on the map with at least one Survivor. Gather the Equipment and Survivors that escaped. You win if you have at least one Canned Food, one Rice, and one Water card. Each Objective token gives 5 experience points to the Survivor who takes it. The living are losing ground. The pockets of resistance fall one after another, and our CB radio, once bustling with messages, is now silent. We must leave. The zombies are growing in numbers, and our supplies are getting scarce. I could kill for some toothpaste. Tiles needed: 4B, 4E, 1B, 7B, 5D, 6B, 3C, 4C & 2C. Reach the Exit Zone shown on the map with all Survivors. The Objective token represents a medicine cabinet. The Survivor who takes it immediately loses a Wounded card. There's a large rest home in sight. The buildings do not look too damaged, and some cars look like they could still run. The supply room is probably full, since it looks like the looters didn't linger here. We pretty quickly saw why: the area is swarming with zombies. The previous inhabitants couldn't really put up a fight. Before exploring, We have to clean up. I dream of bubblegum. Tiles needed: 2C, 4D, 4B, 5C, 6B, 5F, 1B, 3C & 4E. Reach the Red Danger Level with at least one Survivor. The pimpmobile can be searched only once. It contains either Ma's Shotgun, or the Evil Twins (draw randomly). You can Search a police car more than once. Draw cards until you find a weapon. Discard the other cards. The Aaahh! card triggers the appearance of a Walker as usual and interrupts the Search. Our new shelter is not enough protection. The zombies just keep coming. We can't sleep, and some of us are beginning to lose our grip. There must be a nest around here, probably in the business area near the subway entrance. Until this threat is neutralized, We ll be continuously attacked. I could use a new pair of shoes in my size. Tiles needed: 3C, 4D, 2C, 5F, 4E, 4B, 2B & 5C. 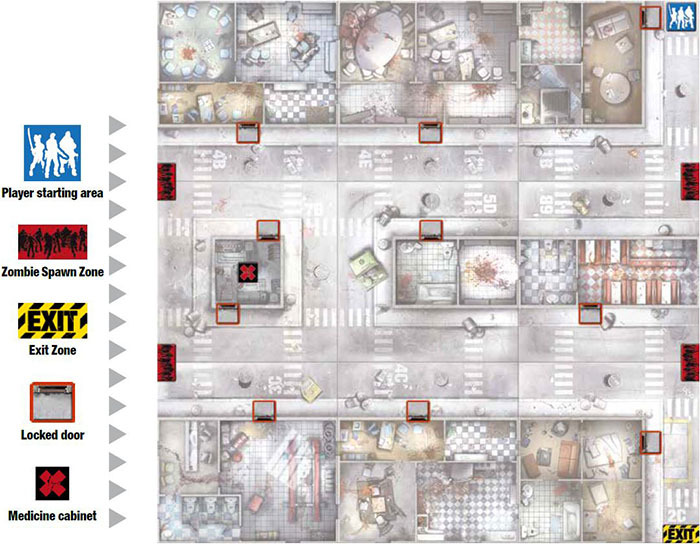 After fulfilling the objective above, all remaining Survivors must reach the same Zombie Spawn Zone and make sure there are no Zombies left in it. Zombies are dangerous, but they may not be the greatest threat. We always have to find new resources, food, weapons, ammo, and above all safe shelter. Here we are in the city center, a cemetery of concrete and glass. The big office buildings are definitely infested. Hopefully, though, we can find the means to survive a few more days. Remember, we must not open more than one door at a time and must not make too much noise. Otherwise, all the zombies in the city will be on us in minutes! I dreamed of bacon yesterday. Just bacon. Tiles needed: 5D, 2C, 1C, 7B, 5C, 6B, 5E, 1B & 4B. In the first hours of the infection, everybody mobbed the supermarkets to get food. Big mistake. Public places were swarming with zombies. We've stumbled on a Z-Mart in the suburbs. Till now, everybody who entered just increased the number of infected. Today is our turn to brave the crowd. We've finished the last of our supplies. We have no choice...but we have experience and team work. I need a bigger gun... and toilet paper. Tiles needed: 4C, 2C, 7B, 3C, 1B & 5D. Place up to six supply cards under the car tokens. The supply cards can be Canned Food, Rice, or Water cards. Get into as many cars as needed with the remaining Survivors. Reach the Exit Zone with the Survivors in the cars. 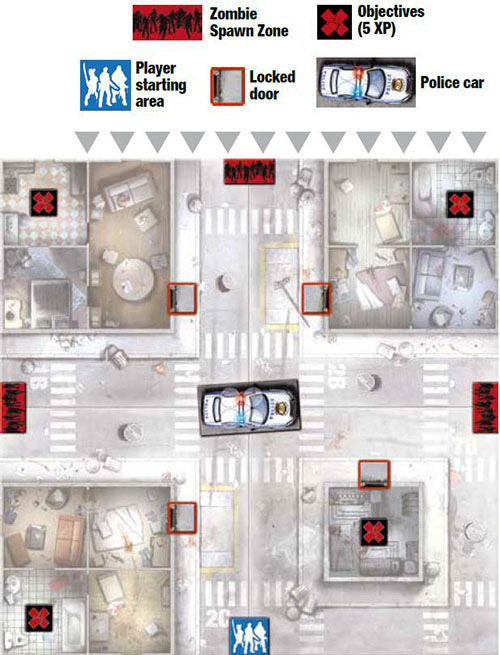 A car that reaches this Zone leaves the board with its occupants and the supplies it contains. Put aside the supply cards that made it off the board with the cars. You win if there are six or more. You cannot Search the Survivors' Starting Zone. Placing supplies in a car: At the cost of one Action, a Survivor can place (or take) one Canned Food, Rice, or Water card under a car token in the Zone he currently occupies. You can use the cars. While everything was collapsing, there was an accident at the nuclear power plant. Before disappearing, the authorities placed a large number of the power plant technicians in a wing of the hospital under quarantine. We must make sure these people are sealed in there forever, especially if they are infected. Why? Because there s one thing worse than a zombie: a radioactive zombie. I wonder where all the dogs went. Tiles needed: 3C, 2C, 2B & 4C. Neutralize the Zombie Spawn Zones. Dual door opening: Opening a door opens the other door of the same building as well. 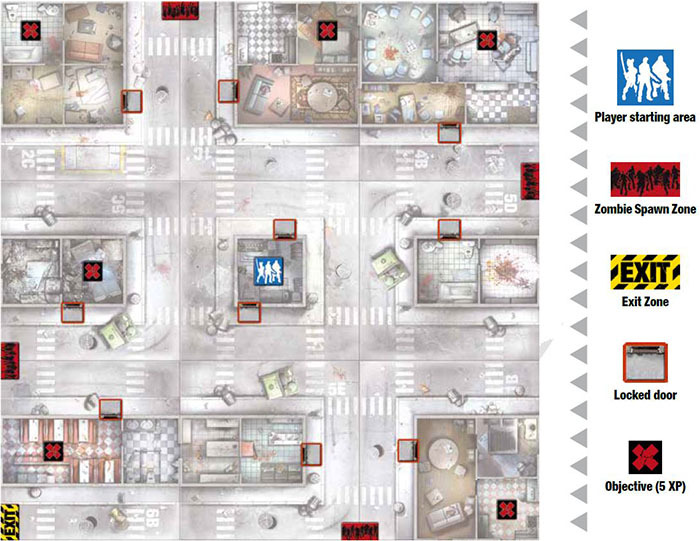 Zombie occupation: Each building Zone contains a single Walker at game start. Resolve a Zombie Spawn as usual when opening doors. 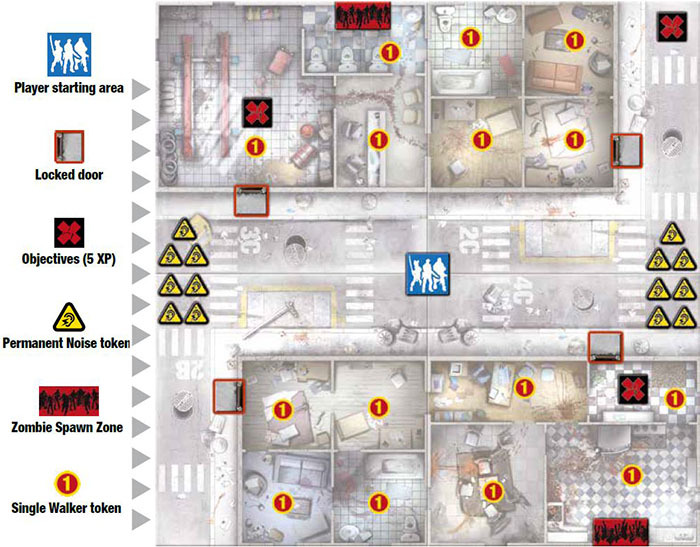 Zombie Exit: Two Zones shown on the plan contain seven permanent Noise counters. 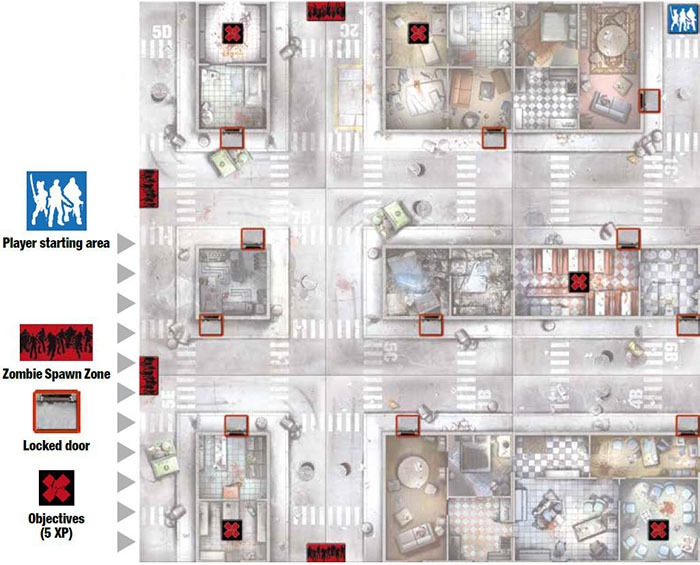 These Zones represent the exits through which the Zombies might escape. If a Zombie reaches one of these Zones, remove it from the board and place it aside. 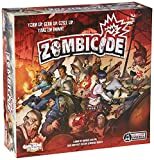 If four Zombies leave the board in this way, the game is immediately lost. Neutralizing the Zombie Spawn Zones: A Survivor can neutralize a Spawn Zone in Zone he currently occupies for the cost of one Action. The Zone must contain no Zombies. Please note the Zombie Spawn Zones are active even if doors are locked. We killed a zombie that had been the mayor of this town. It was carrying a fax from the chief of police explaining how to reach a safe hideout, an old, underground facility that had been turned into a bunker, close to the police station. Apparently it contains an armory, food supplies, and even a shower. This bunker would be the perfect shelter for us. 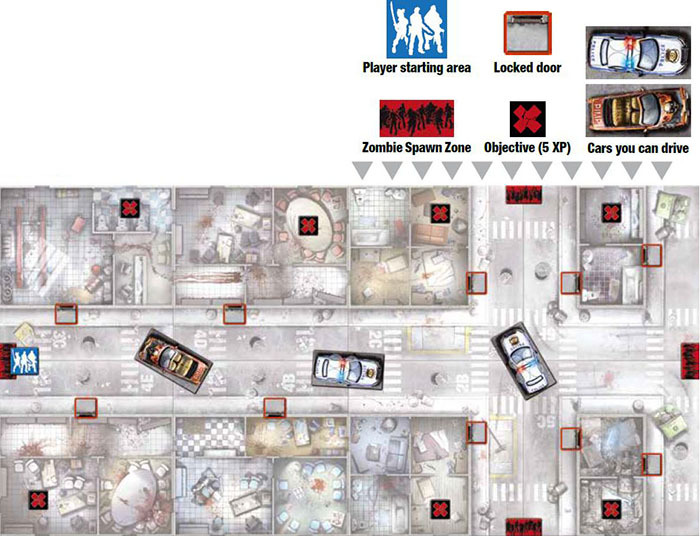 Its entrance, however, is controlled from a distance, and the district is swarming with zombies. This is a dangerous mission but well worth it. What doesn't kill you today just might tomorrow. Tiles needed: 2C, 7B, 4B, 1B, 5C & 3C. 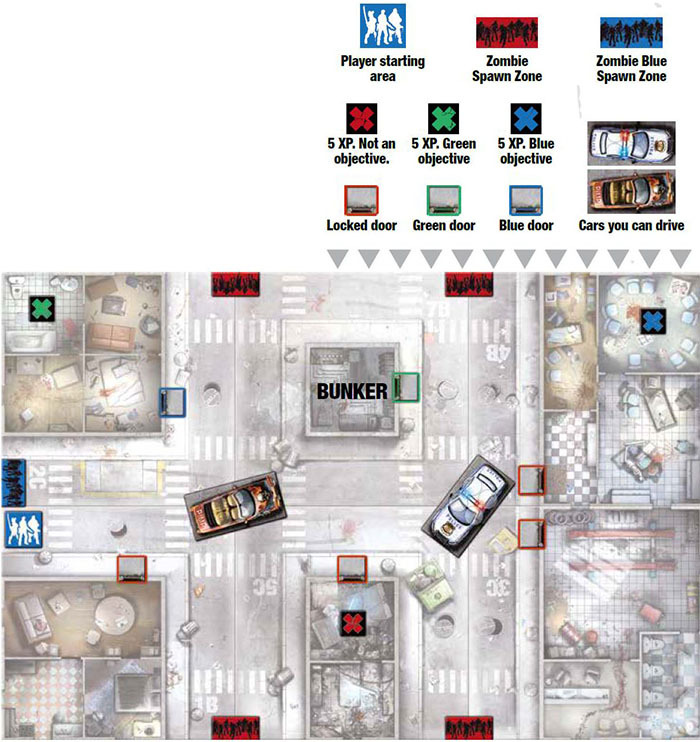 Place at least one Survivor in the "bunker" Zone shown on the map. The bunker must be cleansed of all occupying Zombies. The blue door cannot be opened until the blue Objective has been taken. The blue Spawn Zone will be activated when the blue Objective has been taken. The green door cannot be opened until the green Objective has been taken. We've found a shelter, and we have enough supplies to feed a small army. There s also a radio that s still working. Thanks to this, we've found another group of survivors in the suburbs. They are defenseless and surrounded by zombies. There's no reason for this to be a trap. United we stand. Let's make some new friends. Found dental floss today, it felt like Xmas. Tiles needed: 1B, 2B, 2C & 7B. Note: Might Makes Right was designed for one to three players. Return to the starting Zone with at least four Survivors (one player), five Survivors (two players) or six Survivors (three players). 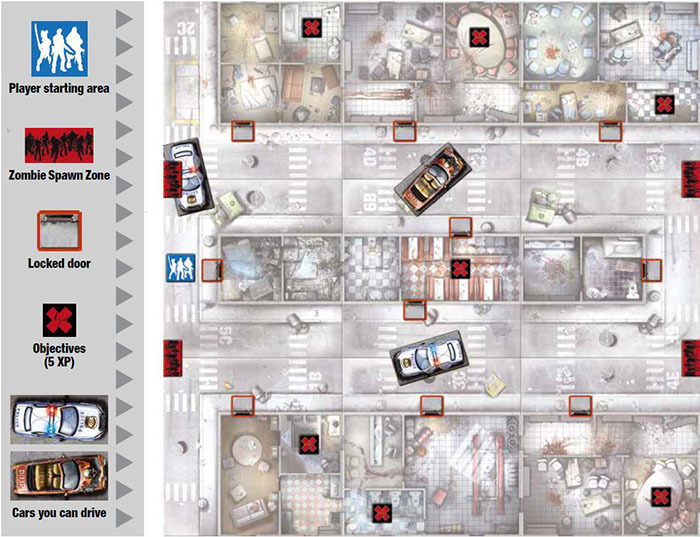 A Survivor placed on the starting area can leave the board during his turn. Put him aside with his Equipment cards. You achieve victory as soon as the required number of Survivors is put aside. Each player begins the game with a single Survivor. Four Objectives are visible on the map. Three of them are "neutral" with identical sides. The fourth is marked with a standard side and a blue side. Place the counters face down and randomly so no one knows where the marked counter is. Each Objective token gives 5 experience points to the Survivor who takes it. Each time a neutral Objective token is taken, the player who controls the fewest Survivors randomly picks a new Survivor (in case of a tie, the player who took the token decides). The new Survivor is revealed and placed without Equipment on the Zone where the Objective token was taken. He may now be played as normal. Revealing the marked objective token doesn't grant an additional Survivor but still grants 5 experience points. You cannot use the cars. You can search a police car more than once. Pick cards until you find a weapon. Discard the cards which are not weapons. The Aaahh! card triggers the appearance of a Walker as usual and interrupts the search. Back to basics. We're exploring the surrounding area in wider and wider concentric circles around our hideout. Several weeks have passed since the infection began, and the zombie population has peaked. What may seem like a routine mission is actually an ordeal where the smallest mistake could be fatal. Glad I quit smoking or all this running around would kill me. Tiles needed: 7B, 2B, 5B & 5C.